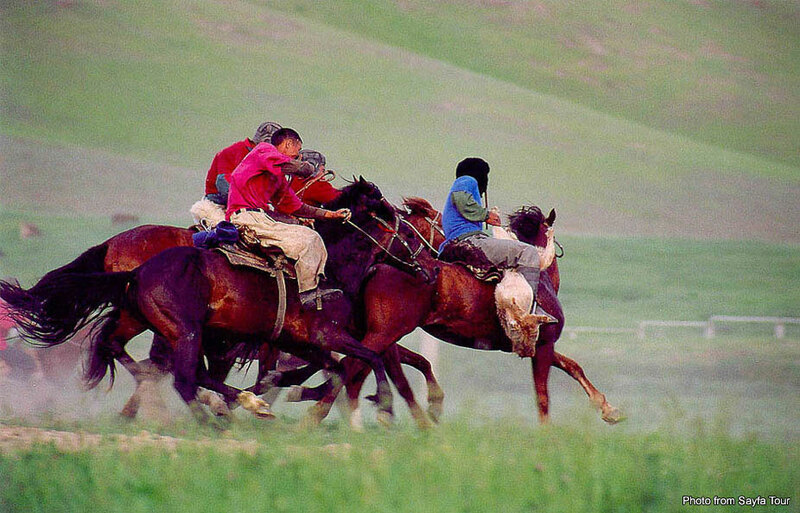 Horses are "the wings of the Kyrgyz", according to an ancient proverb. For 2,500 years this valuable beast has been at the heart of nomadic life - a friend, worker and a source of food. It gave them supremacy over settled cultures, bestowing freedom, carrying yurts and people over the mountains, and supplying meat, leather and milk for the national drink, kymyz. Ideally built for its mountain task, the sturdy Kyrgyz horse has "eyes as big as bowls" and muscles that "ripple like the waves of a great mountain river". 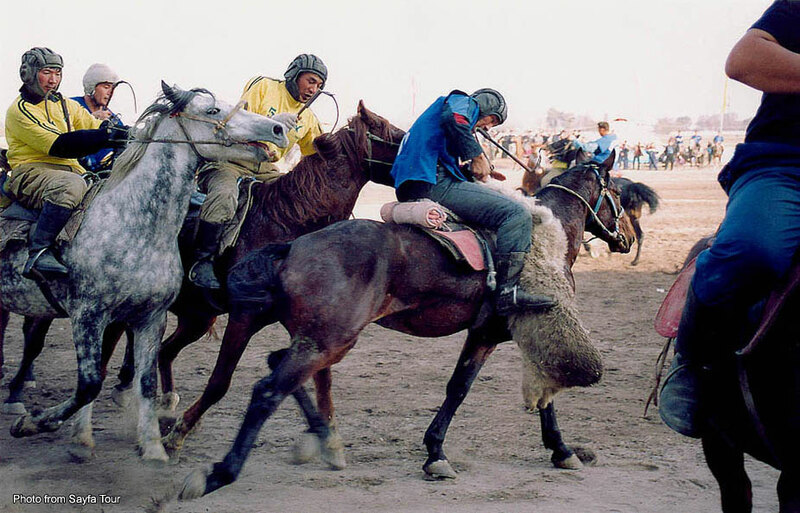 Today, it still commands a mystique; horsemanship is prized above all and no celebration is complete without equestrian races and games, such as ulak-tartysh or kok-boru, in which two mounted teams compete over a goat carcass. To watch these games, with their pounding hooves, gleeful shouts and exhilarating battles, is to step back in time. 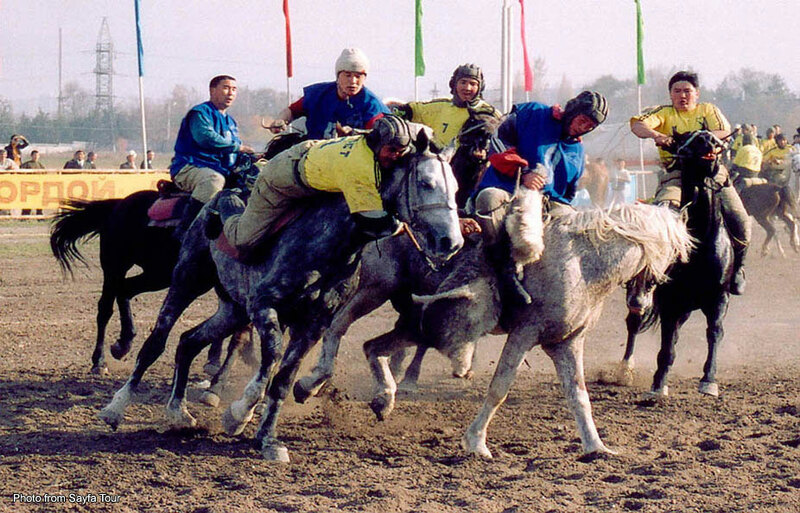 The biggest and most exciting equestrian festival is the four-day At Chybash Horse Festival, held in autumn each year, when thousands of Kyrgyz gather to reclaim their ancient heritage and celebrate their centuries-old culture. This game takes place between two teams of 6 to 10 riders whose object is to throw a goat carcass into the opposing team's goal. This gets extremely rough, and the strength required to muscle through the defense and heave the 20-kg carcass into the goal is daunting. 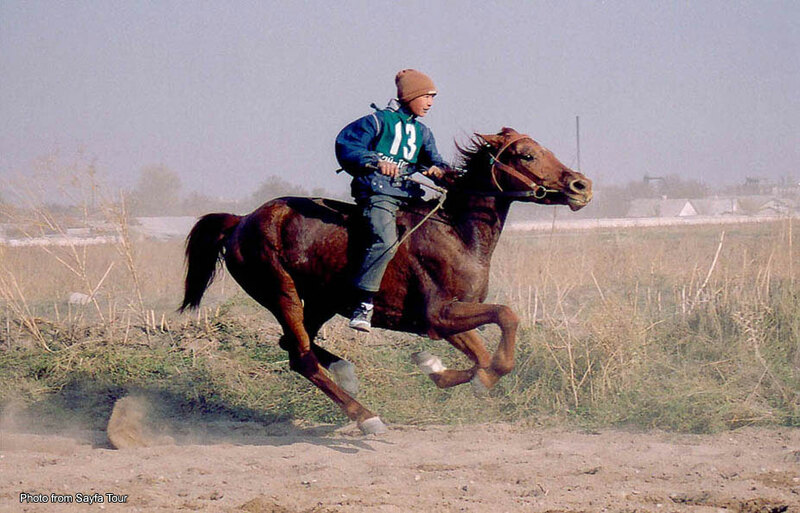 Kyrgyzstan's national team regularly takes home the world championship (though ulak is mainly a Central Asian game, Russia and India have teams, and Germany and Japan have petitioned to play in 2004). This is a contest between a young man and a young woman, both on horseback. The object of ithe game is for the man to try to overtake the woman. The woman is given a faster horse and a head start of about 5 to 10 seconds. Only then can the young man start his pursuit. If he catches her, he is rewarded with a kiss on her face. If he does not catch up with her, then the woman gives him a lashing with a whip. Upai Upai ("score") is a children's game played with chuko (sheep bones) on flat ground. Somewhat similar to the Western game of marbles, the object is to knock as many chuko as possible by throwing a weighted chuko or large rock from a distance. Each 3 chukos knocked make one set called an upai or basyrn. The goal is to gain as many upais as possible. 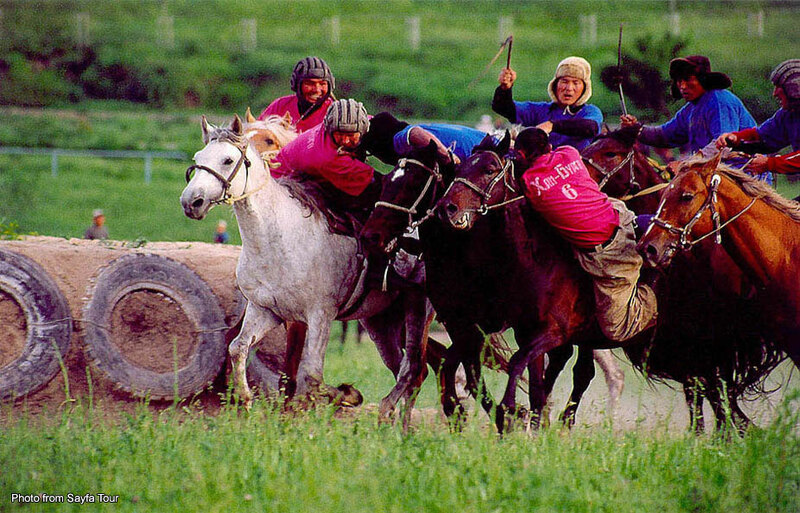 The Kyrgyz play many other games: at-chabysh (horse racing), jamby atmai (archery), kurosh (wrestling), oodarysh (wrestling on horseback), tiyin enmey (picking up a coin from the ground I at full gallop), nardy (a simplified version of backgammon), and ordo (capture the king's palace - a game played with animal's bones ("alchik").